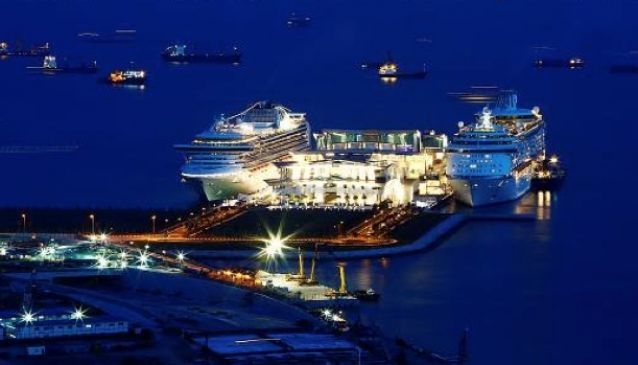 Spread on 28,000sqm, comparable at three football fields, the Marina Bay Cruise Centre of Singapore (MBCCS) is a dedicated two-berth cruise facility, which has been conceived to welcome some of the world's largest ships. Officially opened on 22 October 2012 and operated by SATS-Creuers Cruise Services (SCCS), the MBCCS aims to become a regional cruise hub and its activities will significantly expand the cruise landscape in Singapore and the ASEAN region. Conveniently located near the Marina Bay area and Changi Airport, MBCSS is an attractive homeport with already 10 cruise lines starting and ending their journey there. This is a fantastic gateway to the Asia Pacific region. The cruise destinations include: Darwin in Australia; Bandar Sri Begawan (Muara) in Brunei; Hong Kong; Benoa, Bali and Semarang in Indonesia; Kuala Lumpur, Malacca and Penang in Malaysia; Bangkok, Ko Samui and Phuket in Thailand; Ho Chi Minh City.